Can you tell what it is yet? BCC's new motorised pull-along bin carts? 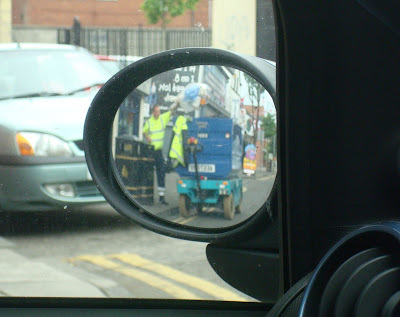 Belfast City Council have a new motorised bin cart out on the streets - a kind of skip on wheels - that can be pulled along (power-assisted) behind someone walking up the middle of the road. Bags of commercial rubbish can then be dumped inside. Bizarre looking, but no doubt more practical than driving huge bin lorries down some of Belfast's more crowded streets! Ticketing is partly online, partly via the ticket hotline, and occasionally from venues direct. Check the programme or online festival calendar for precise details. One of the most bizarre and intriguing performances is the Two Roads West drama that plays out to a small audience in the back of a black taxi. Bill guides Rosie, back after 40 years away in London, as she looks back at her memories of the city. Identity. Politics. Change. You’ll need to book in advance for the Kabosh performances leaving the West Belfast depot and head up the Falls and back down the Shankill. Thursday 30–Saturday 1, Tuesday 4–Saturday 8, 2.30pm, 4pm, 6pm. Strongly recommended by those who enjoyed the trial as part of CQAF earlier this year. Performances in An Culturlann Sunday 2 and Monday 3 at 7.30pm; in Welder’s Club, Dee Street on Wednesday 29 and Thursday 30 at 8pm; and in Spectrum Centre, Shankill Road on Tuesday 4 and Wednesday 5 August at 8pm. Action on Disability have adapted the The Wizard of Oz and created The Wizard of Falls. Children, teenagers and adults with various disabilities transport Dorothy from the Doyne to the Falls Road. St Marys University College at 7pm on Monday 3 August. Lara Marlowe has been the Irish Times Paris correspondent for over ten years, She’ll be talking and taking questions about her experiences of conflicts around the world, including civil wars in Lebanon and Algeria, the former Yugoslavia, Iraq, Georgia and Gaza. St Mary’s University College on Saturday 1 August at noon. That’s followed in the same venue at 2.30pm by a rare interview with Brendan Duddy, the “Secret Peacemaker” who provided a link between the British Government and the IRA. In conversation with Brian Rowan. 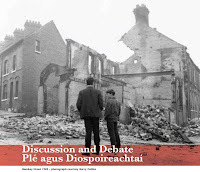 And on Monday 3 August at 1pm in St Mary’s University College, there’s a two hour event organised by Relatives for Justice looking at the recommendations of the Eames/Bradley Consultative Group on the Past, including the investigative Legacy Commission, information recovery and the controversial recognition payment. Guest speakers still to be confirmed. Irish President Mary McAleese will deliver the annual PJ McGrory Human Rights lecture in St Mary’s University College on Tuesday 4 August at 7pm. Anne Cadallader will chair a new West Belfast Youth Talks Back question and answer session in St Louise’s Comprehensive College on Wednesday 5 August, 2–4pm. With a panel of community workers, politicians and police from across Belfast, it’ll give an opportunity for young people to deal with the issues that affect and interest them. The West Belfast Talks Back for grown ups (or is that just bigger children?) 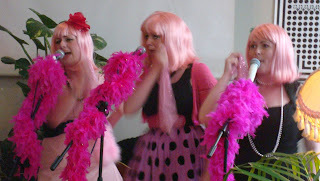 is in the same venue the following evening between 7.30–9pm on Wednesday 5 August. This time, William Crawley will herd the political, religious and trade union cats, while Tim McGarry will provide commentary from his black taxi. Workers from the closed Visteon plant in West Belfast will tell their story at St Mary’s University College at 1pm on Friday 7 August. On the soundtrack of The Lion King, on the Pyramid Stage at Glastonbury, and now appearing in Clonard Monastery, the London Community Gospel Choir will be performing along with local group Casadh on Wednesday 5 August at 7.30pm. And if you’re on a Metro route in and out of West Belfast Friday 31, Saturday 1, Friday 7, Saturday 8 (afternoons) you may discover you’re accompanied by the strains of traditional Irish music being plaid live in the bus. Who wants to be a DJ? Féile FM’s drivetime presenter Paul McCusker is running taster sessions at Conway Mill on Tuesday 4 and Wednesday 5 at 1.30pm. Sean McKernan (who established Belfast Exposed) is leading Photographic Tours of West Belfast on Tuesday 4 and Thursday 6. Meeting up at Fresh Claim Photography Centre, 48 King Street at 11am, they’ll be issuing black and white 35mm cameras to participants along with some basic photography training, wandering around documenting West Belfast, and the returning to the centre for lunch and a choice of Photoshop or 35mm darkroom skills workshop. Everyone will be given their original work on film or disc, and a selection of the best material will be displayed in the Fresh Claim Gallery. Now he’s hung up his mayoral chain, Tom Hartley is back at this year’s festival with his two hour tour of Belfast City Cemetery. A published author on the subject, he’ll be telling “the story of finance, empire, the rise of northern unionism and the golden ear of industrialisation in Belfast through the graves of its citizenry”. Sunday 2 August (Jewish burial ground), Monday 3–Saturday 8, all at 1pm. Over in Milltown Cemetery, Pod Devenney (from Coiste) is running two hour tours of the family plots and republican plots every day at 1pm from Monday 3–Saturday 8. And there are three hour Coiste Political Bus Tours with representatives from both communities filling you in with the political and historical story of the Falls Road and Shankill Road. Starting from the Art Shop on Falls Road at 1pm on Monday 3, Wednesday 5, Friday 7 and Sunday 9. Last night’s Sunday Service was one of the last events of this years trans festival. Previous Sunday Services – held as part of the fringe events around the reopening of the Ulster Hall in May – used actors to revoice famous speeches by Martin Luther King and Hitler amongst others. Taking anti-disestablishment rhetoric from history, stripped of their original context, to ponder how they have changed history for better, or worse. Last night in the Black Box, three snippets of oratory were interspersed with music from the colourful and amazingly joyful Koko and the Boomtown Cats. Noel McGee replayed a 1993 speech by Urvashi Vaid which talked about “mainstream” perceptions of gay people. Hearing the speech sixteen years after first given, it did make me wonder whether (or how much of) the Christian Church still treats the LGBT community as freaks? Grainne McCann read from an anonymous 1990 manifesto that was handed out during the New York Gay Pride march. It could be summed up as angry. Very angry. Whereas Vaid sought liberation and justice through the lesbian and gay community working within mainstream groups, this second speech asserted that the marchers “must fight for ourselves - no one else will”, quoting examples of society not standing up against prejudice and institutional failure to deal with HIV and Aids and the associated persecution. Strong stuff. And anger that resonated with some of the imagery in the Psalms where David voices his frustration. Maybe even shades of Jesus’ anger in the temple? The final speech came from Harvey Milk, read by Niki Doherty. A message of hope from the murdered San Francisco politician in the 1970s. It struck me listening to Milk’s more upbeat message that for most of it the terms gay and lesbian could be substituted for Muslim or Polish or Roma or immigrant and the argument would still have been strong. Moon - will the real Sam Bell please stand up? A group of us headed up to the QFT on Thursday night to see Moon, a low-budget, independent science fiction film that got its release timing just right to coincide with last week's Apollo 11 anniversary. Lunar Industries are harvesting Helium-3 from the moon which is returned to Earth to be used as clean energy. The process is pretty much automated, using four huge harvesters named after the four gospels! 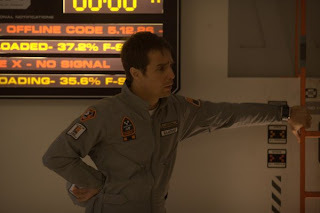 So they've just one employee on the moon - Sam Bell (played by Sam Rockwell) - who's contracted to live alone, keep an eye on the heavy machinery and load the harvested fuel pods into what looks like an escape pod and send them back down to Earth. Technical difficulties mean that there's no real time comms link to Earth. So instead all his messages arrive as videograms. So Sam's only day-to-day conversation is with GERTY - a robot (voiced by Kevin Spacey) designed to look after him. As the film starts, Sam has only a few weeks of his three year contract left to run and is looking forward to returning home. Just why Sam was chosen for this role is ambiguous. From the video messages we see, the relationship with his wife Tess had been strained. Had he been in prison? His background is never explained. But it's been a lonely three years, and his mental health is beginning to suffer. Shot in 33 days in the K and W stages at South West London's Shepperton Studios, Moon is only 97 minutes long and feels like a screen play that grew out of a classic science fiction short story. About a quarter of the way through the film, Sam has an accident while out in the lunar rover to collect helium from one of the harvesters. He wakes up in the base's infirmary, and is told by GERTY that's he must be confined inside until a rescue crew arrive to fix the harvester and take him home. I want to avoid totally giving away the film's big plot point. (The film's press kit has lots of detail to digest after you've seen the film!) But while Moon has shades of Solaris and Sunshine, it's not a psychological thriller. There's tension, but not in huge quantities. Clint Mansell's music sets a lonely and mechanical tone to the film. Perhaps the film's biggest failing is that the audience largely fails to empathise with Sam Bell. We understand his dilemma, but don't feel his pain. No one cries! The ending is satisfying and appropriate - even though it seems to create unnecessary holes in the plot. And the last few seconds may well tee up director Duncan Jones' next film that will be set in the same universe as Moon. It's on in the Queens Film Theatre for another couple of days. It's a film that asks questions about the value of life, corporate ethics (Lunar Industries is a "green" company, but it's not entirely transparent), as well as a healthy dose of bioethics. 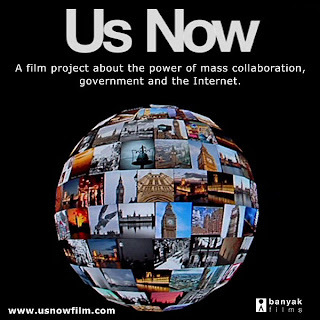 Us Now film - social participation, mass collaboration, democratic opportunity? I can't actually remember how I stumbled over the film Us Now a week or two ago. But what I could quickly understand about it triggered me to order a copy on DVD to watch on TV rather than sit through the 59 minute long documentary online on a small screen. It's a film that explores changing patterns of social participation through a series of interviews with web visionaries, bearded boffins, couch surfers, football supporters and the odd politician too. It asks what government can learn from the kind of mass collaboration that is becoming the norm for a growing (though perhaps still small) proportion of society. Case studies edited into documentary include couch surfing (the practice of opening up your spare bed to strangers who book in over the internet), Netmums, Ebbsfleet United (football club where over 30,000 fans democratically select the team) and Zopa (an online money exchange allowing people to offer to lend money to others who wish to borrow). While the film is careful to balance the utopian vision with some of the possible weaknesses of following the crowd, it does intelligently explore some of the opportunities and in particular challenge governments to consider embracing the crowd. And useful to see the film include examples of participation and community decision making that didn't require electronic tools but could instead support enfranchisement face to face. There's a good discussion of transparency - which can engender trust in and bring stability to an organisation. Yet a naked organisation needs to look good in the buff! Overall, it's a documentary that more people should see. Particularly, those who are grappling with new social participative tools, and those who think they've been elected to rule/govern/serve. If I could be critical for a minute, the background music is a bit too overpowering in the first few minutes of the film, overpowering the softer words. So it's a shame that the PAL DVD doesn't have subtitles (though there is an online version with subtitles). There's also a nearly complete focus on London imagery - highlighting Westminster government functions and denying the UK's considerable devolution. Strikes me that it will be compulsory viewing at the upcoming "adult" version of PCI's Technology Camp that will be up and running this time next week. And makes me wonder whether someone shouldn't arrange a Northern Ireland screening for practitioners and politicians. In the meantime, you can watch it online, and if it catches your imagination, the Us Now website gives access to rushes of the longer interviews conducted during filming and the written transcripts can be browsed through. Us Now was directed by Ivo Gormley, produced by Hugh Hartford and edited by Mark Atkins. As many predicted, an honest man wasn’t returned to parliament in the Norwich North constituency. Instead a woman, Chloe Smith, comfortably won the by-election for the Conservatives. Aged 27, she takes over the mantle of Baby of the House from 29 year old Liberal Democrat Jo Swinson. The Labour candidate was hospitalised with suspected swine flu earlier this week. Not the most positive turn of events for his already difficult campaign. Chris Ostrowski’s wife represented him at this morning’s count. Labour voters - bitterly resentful at the party for making an expenses scapegoat out of their MP - stayed home from the polls in their droves. Had the popular Ian Gibson decided to stand as an independent, Labour would almost certainly could have been pushed into third place. The colourful independent candidate Craig Murray received 7% of the votes for his Put an honest Man into Parliament party. He got the highest vote of the six independent candidates, also beating the BNP by twelve votes. Will they put an honest man into parliament in Norwich North? The wheels of democracy are back in action in the North Norwich constituency today as it’s by-election day. As mentioned in a post at the end of June, Craig Murray - blogger, former (sacked) British ambassador to Uzbekistan, author (twice), and now politician - is standing as an independent candidate under an anti-sleaze banner for the Put An Honest Man Into Parliament party. Every candidate in a parliamentary election has the right to have one "election communication" delivered free of charge by the Post Office. These are normally rather dull leaflets, so I decided to put my election address on a DVD. It's rather picturesque and entitled "A Norfolk Journey". 80,000 copies are being made. Must be sorted by postcode and address - mine is. Extraordinarily, the Post Office must also vet the content for libel, incitement to violence or incitement to racial hatred. That is a strange bit of censorship - they don't check the content of normal mail theydeliver - but my DVD passes that test too. Of course, as well as the patience of Job to overcome bureaucratic obstacles and obfuscation, every independent needs a gimmick. And Craig Murray was blessed with the talents of the Corrigan Brothers and The MP Expenses Song – the group who previously brought us the ditty There's No One As Irish As Barack Obama. Incidentally, the Corrigan Brothers recently sent the gold disc (for the Obama song, not the Expenses one!) for international sales to President Obama and received a letter back from him a week or so ago saying “this will take pride of place in the White House”. Unusually for England, the by-election is not being counted overnight, but will instead wait until Friday morning, with the result expected around noon. Northern Ireland 3G coverage ... another digital divide? Northern Ireland experiences many different digital divides. There are areas in geographic folds that suffer poor FM radio reception, never mind the pockets which don’t have any (or indoor) DAB reception. Freeview coverage isn’t total, and is unlikely to significantly improve until digital switchover can start in NI around 2012. As well as problems of cost/age/interest that prevent some households from investing in computers and broadband, there are also commercial and technical availability constraints that mean that cable and broadband/DSL doesn’t pass by everyone’s front door or farm yard. When it comes to mobile, GSM (and GPRS) mobile coverage reaches a lot of parts it didn’t ten years ago. But 3G is a different story. Earlier in July, Ofcom published coverage maps for the five UK 3G providers as their networks stood at the end of 2008. There’s a real divide. Living in or commuting between some post codes - like Greater Belfast - you’ll think 3G is ubiquitous. Live elsewhere and maybe one or more likely zero providers will cover your area. Belfast is back in the midst of festival madness. The fun of the Eurocultured weekend didn’t seem to be dampened by the rain as artists and musicians took over the Cathedral Quarter streets and venues. And the Trans festival is still running. The Electronic Crèche will offer newspapers, free wifi, Wii, coffee and music in the Ulster Hall café on Saturday 25 from 2pm. Remember that you can pick up a form for their scavenger hunt at any time on the trans website or from the Waterfront Hall ticket desk and go it alone. And this Sunday afternoon 26 July you can join an organised hunt that leaves outside the Waterfront Hall at 3pm. And from 31 July to 9 August, Féile an Phobail will be taking place in West Belfast – worth a post all of its own. Ok - it's an advert for the new Olympus PEN camera. But it's also an incredibly creative film, and anyone who has tried their hand at stop motion animation will appreciate the effort, skill and planning that went into the production. An incredible 60,000 snaps taken, 9,600 printed and another 1,800 pictures shot again. Seems to be partly inspired by Takeuchi Taijin's Wolf and Pig animation. Everyone's reforming. I blame Luther! 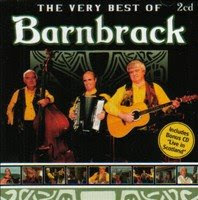 And now it's the turn of Belfast folk group Barnbrack. I've fond memories of going along to the Arts Theatre to hear them work through a familiar set of songs including Belfast, Mickey Marley's Roundabout, Shhht the Fly and an irritatingly catchy Alphabet Song (interspersed with nursery rhymes. This morning's Belfast Telegraph reports that after a six year break, they'll be back on stage this summer to celebrate the 25th anniversary of Alex Quinn's ballad Belfast (lyrics and chords). In the meantime, the YouTube links in the song titles above can stir your memories. £3 films at QFT on Mondays! Queen's Film Theatre is now offering cut price cinematic treats on Mondays. All seats for all films are being offered at a bargain £3. Tickets available online or at the box office. Just a pity the QFT website is so poor at showing what's being screened on a particular day. I just wanted a simple calendar on which I could click a day in the next week or two and see what was listed. But instead, the films only seem to be organised by title. Taxonomy fail. Is it just me, or do you agree that someone's allowed a requirement user story to drop off the table! They also make it incredibly difficult to find an up-to-date logo to illustrate a post about the QFT! I ended up for dinner in The Barking Dog on the Malone Road on Friday night for a lovely meal with fellow Queens Radio seminar sohorts - Matt, Keith and Kathy - fresh from teaching us all how to read the news. 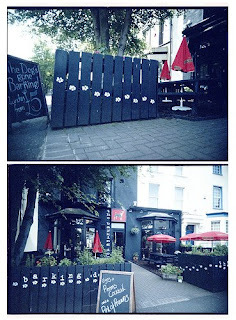 The Barking Dog is just up from The Bot and right across the road from the Eglantine Inn. Didn't it used to be the other Gourmet Burger Bank branch? Anyway, parking was easy. The atmosphere inside was good. The service was fun and friendly - perhaps even slick! I loved the menus that were attached to wooden clipboards - gimmicky but not pretentious. Reasonable selection of food, enough to choose from. My home-made scotch egg starter was fresh, warm and runny. And the main course gnocchi was tasty and not stodgy. Everyone seemed to enjoy their meal. And the prices weren’t extravagant. You can always check out local comparison site Lookaly and see if anyone else has anything to say about it. While the P&O ferry is laid out a bit like an plane, not everyone sits up straight! Some take the opportunity to do some exercises ... aerobics, yoga, or just preventing DVT - deep vein thrombosis? Meanwhile, it is a good opportunity to state the obvious and say that posting has been sparse as I've been away on holiday. But no doubt some Scottish adventures will be relived in coming days. Every now and again, websites slip up. Sometimes it's the BBC referring to NI's new MEP as Diane Doods. Other times, it's the Belfast Telegraph's ability to misspell Northern Ireland. It's official, haggis tastes like stuffing. And a Scottish Fry really misses out on not having potato bread! 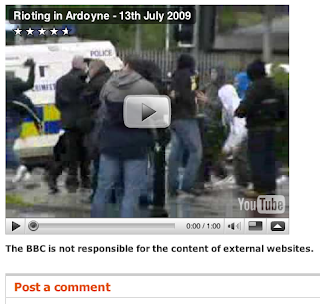 Culture Northern Ireland borrowing Orangefest photos from Flickr? 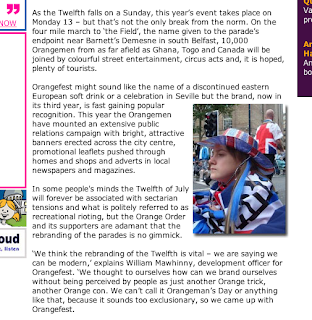 Reading through Culture Northern Ireland's latest newsletter, I clicked on the link to an article titled Orangefest. And was surprised to recognise one of the photos half way down the page. For a while, a girl who'd been standing with her family on the roadside, came across and sat on the traffic island, joining our crowd of mad people and the odd press photographer who came and went. She was decked out in Twelfth clobber, yet had none of the celebratory attitude to do with her fashion. Instead, she sat and looked into the distance. 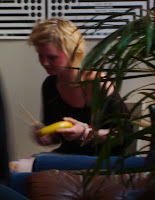 I held the camera to one side and surreptitiously (sounds better than "sneakily") took a couple of shots. Now I've never got around to choosing and applying a license to my photos on Flickr. One of those many things I've never quite got around to. For now, the're all sitting there with a copyright symbol beside them. I've never refused anyone permission to use a photo who's asked ... and when I've wanted to use someone else's for the blog, I've learnt to pop a comment on to say and ask if they mind. So I was surprised to find that Culture Northern Ireland had filched a picture from my Flickr feed without asking, and without acknowledging. Particularly hypocritical given the link at the bottom of each page to their strong copyright statement that covers the CNI site, and the individual copyright link up at the top of the article! Of course, maybe they just nicked it off the blog post and not Flickr? I wonder who supplied the other shots the illustrate their piece? And in case they're wondering - they are welcome to use the shot - just would have been nice if they'd asked.